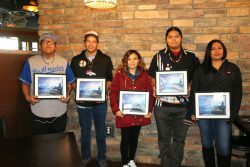 On November 11, 2018, six high school students from the Ute Mountain Ute Reservation in Towaoc, Colorado, screened their nine-minute documentary, Ute Mountain Tribal Park: Meditations, Blessings and Prayers, as part of Denver International Film Festival’s Colorado Documentary Shorts Program. Following the program, the students were awarded a Special Jury Award by the Denver Film Academy. The film is the result of educational efforts spearheaded by the Colorado Office of Film, Television and Media (COFTM) and the Colorado Film School (CFS). In May 2018, the Colorado Commission for Indian Affairs (CCIA) invited COFTM to tour the Ute Mountain Ute Reservation and discover possible ways to partner with the Tribe. While on site, COFTM met with Scott Baker, the Tribe’s Director of Higher Education, and discovered many Ute Mountain Ute high school students are struggling to find drive in the classroom. In many cases, including arts education as part of the curriculum is a great way to motivate and inspire students. COFTM reached out to colleagues at the CFS, and provided a grant for three instructors to conduct a two week workshop on the Ute Mountain Ute Reservation. During this time, students learned to use cameras, drones, how to edit and about the art of storytelling. Students had the opportunity to interview two of the Ute Mountain Ute elders and create a short film highlighting the history, preservation and tradition encapsulated by the Ute Mountain Tribal Park. The Ute Mountain Tribal Park consists of 125,000 acres of majestic canyon country and desert landscapes dotted with cliff dwellings, artifacts and pictographs. The film explores a new generation of Utes tasked with finding a balance between the challenges of a rapidly changing world and the preservation of cultural identity. The workshop was considered a success in that all six students remained engaged throughout the two week session, and made storytelling decisions to reflect their experiences both growing up on the Reservation and visiting the Tribal Park. COFTM, CFS and the Ute Mountain Ute Tribe intend to continue this relationship, creating distance learning opportunities for students throughout the school year, and establish an annual summer workshop on the Reservation.